First detected in Ontario canola in 2016, clubroot is an increasing concern for the province’s canola growers. A University of Guelph research group is a key player in Canadian research to manage this devastating disease and is advancing knowledge about Ontario’s clubroot situation. : In this trial to assess clubroot resistance in some Ontario canola cultivars Innovative Ontario research for clubroot management in canola. The clubroot pathogen, Plasmodiophora brassicae, infects Brassica plants including crops like canola, cabbage and broccoli. Brassica roots release substances that stimulate the pathogen’s soil-borne resting spores to germinate and form zoospores. The zoospores swim through soil water to the roots and enter the root hairs to begin the infection process. The infection causes clubs to form on the roots – the clearest symptom of the disease. The clubs stop water and nutrients from flowing up into the rest of the plant, and that results in yellowing, wilting, and premature ripening and death of the plant. Yield loss from clubroot can reach 100 per cent with susceptible canola cultivars in heavily infested fields. The clubs on a single infected root can produce millions of resting spores. When the clubs decay, those resting spores remain in the soil, ready and waiting for the next host crop. Clubroot is spread mainly by infested soil on field equipment, so the disease typically starts at field entrances. But infested soil can also be carried on vehicles, tools or boots, or be moved by water or wind erosion. Soil surveys by the Ontario Ministry of Agriculture, Food and Rural Affairs (OMAFRA) in 2016 and 2017 found clubroot-positive fields scattered across the province’s canola-growing region. Wet conditions in the spring and summer of 2017 favoured development of the disease, and yield losses occurred in affected fields. Mary Ruth McDonald, a professor in the department of plant agriculture at the University of Guelph, has been investigating clubroot on canola and Brassica vegetables for many years. One aspect of her group’s current work is to conduct the time-consuming process of determining the clubroot pathotypes, or strains, in the samples collected by OMAFRA. McDonald’s group is now pathotyping Ontario clubroot samples from canola and vegetables. Pathotype 2 is known to attack canola; it is a common pathotype in Quebec canola fields that have been tested for the pathogen. So far, her group has identified pathotypes 6 and 2 on vegetables, and pathotype 2 on canola. They have also found possible detections of pathotypes 5 and 8, and they are re-testing those samples to confirm the pathotypes. Pathotypes 5 and 8 are both known to cause clubroot on canola in other regions of Canada, but, if confirmed, this would be the first time they have been detected in Ontario. Many of the clubroot-resistant canola cultivars available in Canada have resistance to pathotypes 2, 3, 5, 6 and 8. 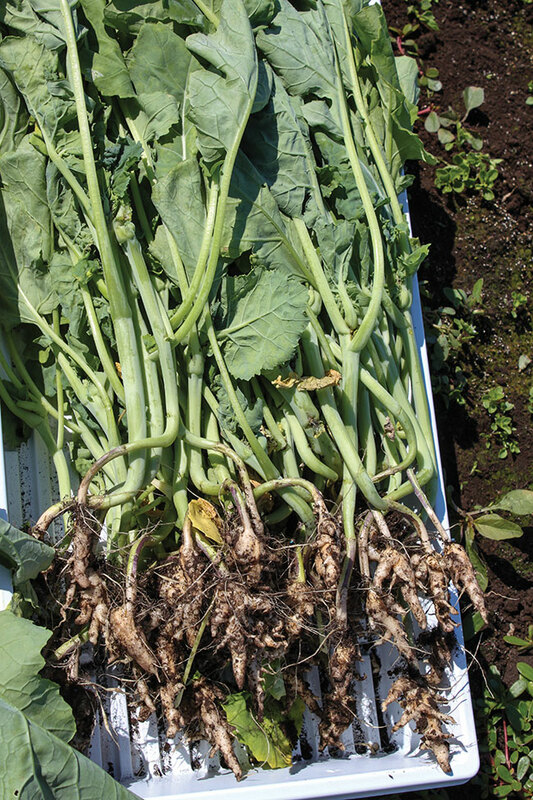 Resistant cultivars are the cornerstone of clubroot management strategies. But one of the scary things about the pathogen is its ability to rapidly overcome resistance genes. McDonald has seen this rapid adaptation first-hand. “At the Muck Crops Research Station [MCRS], where we do most of this work, we noticed that some of the canola cultivars that were resistant in 2011 were forming clubroot clubs in 2014. When we tested these new clubs, we found the pathotype had changed from 6 to 2,” she explains. McDonald emphasizes, “What we saw at the research station is very consistent with what other researchers have been finding: by growing a clubroot-resistant cultivar between two and four times in the same field, you can select for a new pathotype.” This is one of the reasons why crop rotation is such an important part of clubroot management: it is crucial to maintaining the effectiveness of resistant cultivars. 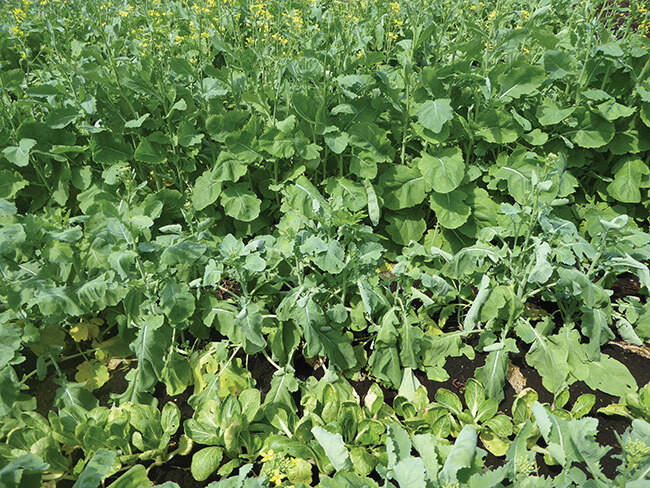 McDonald’s group is currently conducting a trial to assess the level of clubroot resistance in some canola cultivars that are commonly grown in Ontario. Early indications are that some of them are very susceptible while others are quite resistant. For a number of years, McDonald has been collaborating with researchers in Western Canada to explore possible practices to manage clubroot. 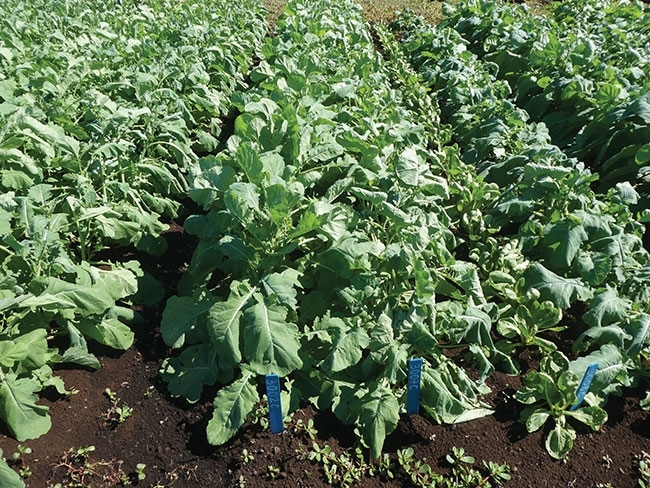 Some of their studies focus on how to reduce small patches of clubroot, whether it’s the first time the pathogen has shown up in a field or it’s a new pathotype emerging in a field after a resistant cultivar has been grown there for a few years. One intriguing patch management study at the MCRS is looking at the effects of grass cover crops on resting spore numbers. Some growers already use grass cover crops on clubroot-infested field entrances to prevent the movement of infested soil, but the initial results from the study’s first year in 2017 suggest a grass cover crop might actually help reduce the number of resting spores. In a related trial, the researchers are assessing the impacts of combining different kinds of lime with the grass cover crops, because the pathogen prefers acidic soils. One of their other patch management trials involves covering infested patches with plastic so the soil will heat up during the summer; they want to see if high soil temperatures affect the resting spores. In addition, McDonald’s group is evaluating the effects of rotational crops like spring wheat and field pea to see if some crops are better than others at reducing resting spore concentrations. Another research focus of McDonald and her colleagues is the potential use of beneficial microbes to help manage clubroot. “A number of years ago we looked at a fungus called Heteroconium that colonizes within the roots of Brassica plants. More recently we looked at two commercial biological controls, one a bacterium and one a fungus. With all three, we found the microbes give some suppression of the disease when the clubroot inoculum concentration is relatively low, but they don’t reduce the disease when the inoculum concentrations are high,” notes McDonald. McDonald and her colleagues have conducted various studies on the pathogen’s biology, which are helping to inform strategies for managing the disease. For instance, the results from their research on temperature thresholds for the pathogen’s development have implications for canola seeding dates. “The pathogen doesn’t really get started on its development until the temperature reaches about 14 C, but canola seed will germinate and the plants will start to grow at temperatures well below 10 C. So, if the plants grow at those cooler temperatures, the roots won’t get infected. And if the roots of a larger plant get infected with clubroot, the disease doesn’t have quite as devastating an effect on the plant,” explains McDonald. Over the past five years, almost all of McDonald’s clubroot research was funded in conjunction with collaborators in western Canada, with funding from Agriculture and Agri-Food Canada (AAFC), the Canola Council of Canada (CCC) and provincial canola grower groups in western Canada, through the Growing Forward 2 program. In particular, she has been working closely with researchers at AAFC in Saskatoon, and she also talks frequently with clubroot researchers at Alberta Agriculture and Forestry and the University of Alberta. Recently, McDonald received funding from the OMAFRA-University of Guelph funding program for research that is more focused on clubroot in Ontario. In addition, she and her AAFC colleagues have applied through the CCC to the new Canadian Agricultural Partnership program to hopefully obtain funding for the next five years of clubroot research. Field crop disease management in Canada part two: Where are we now?